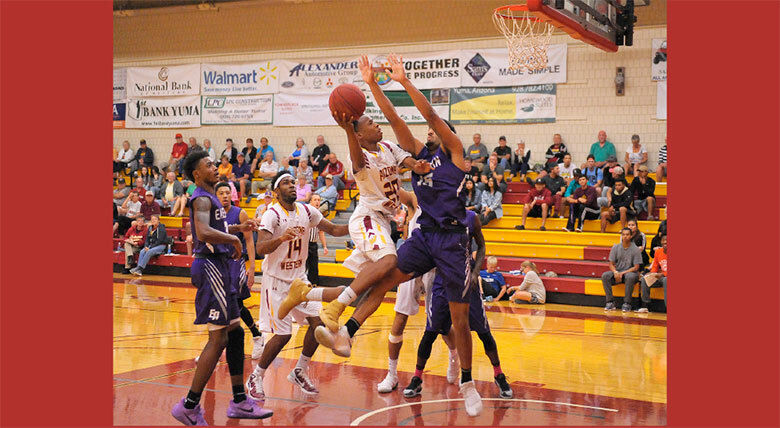 The men’s basketball team at Arizona Western College had a memorable season this year. They finished with an outstanding record of 23 wins and 10 losses and winning the regional championship. Sadly, at the district championship in Utah, they came up short. The team arrived on campus August 19 to start preparing for their upcoming season. In the beginning, their chemistry as a team was not strong enough, yet their raw talent was there. As time went on they started trusting one another on the court. By October, the team felt they were ready to compete, and just in time. In November, they faced their first official challenge, winning a close game against South Plains. Next the team traveled to Texas to play in their first tournament, winning 3 out of 4 games. The team was on a roll, and their chemistry was coming along, which showed in their first home game, when they beat Grand Canyon by 60 points. “This was a good season to learn from and to take this experience into the next season,” said center Andre Allen. “Anybody can get to the to top, but can they rise from the bottom?” added walk-on Syncere Rose. Next the men hit a rough patch, losing two of the four games after the departure of power forward Andre Jones, who had been their leading scorer. At that time, sophomore point guard Brandon McGHee stepped in and carried the team, even though they won only one of the next six games. There was a buzz going around that the Men’s wouldn’t make the playoffs. Indeed, their next game, against Cochise, started off rough. But McGhee delivered in crunch time and lead the team to victory. The Matadors then won seven straight games and rose to number one in their division. A new addition to the team, center Will Miles, helped out with his height and his ability to score and rebound. In their first playoff game, they destroyed Pima. They also cruised through their next game and went on to win the Regional Championship witch they won. After taking a charter flight to Utah, they had three days to practice for the District Championship in Utah, but they came up short in the big game, one game short of competing for the National Championship.